I live in the Chicago area. I'm building a 3 season room addition to my home. I would like to have the room built on top of an 8" concrete trench foundation at least 42" deep (below the frost line), tied into the existing home foundation with rebar, with a 4" slab on top of 4" of CA6. I would like to have the foundation poured with a monolithic pour to save time and money. Can you provide me with any information on the feasibility of constructing the foundation in this manner, and the steps/details for completing this type of foundation. Hi William, that's a great question. I'll try to keep the answer short because its a loaded one. Your approach as explained is exactly how I would do it. The real challenge you're going to face will be excavations to keep them relatively narrow to the 8 inches you want assuming the soil is not sandy. With the depth at 42 inches below grade and another 6+/- inches above grade, depending on how high you want to build to prevent water from coming in to your addition. You're looking at over 4 ft high wall or foundations. I would plan on making this a two pour. First you clear the top 3 to 4 inches of the entire area making sure all the top soil and bio degradable i.e. landscape, grass, top soil, etc are removed. Next layout the footprint of the addition making sure all sides are square. Next rent a trencher and dig the 3 sides assuming the fourth side is against the existing house. Next Tie the reinforcements, #4 vertical @ 16 inches on center and #4 horz. @ 18 inches on center or something like that, the bottom horizontal bar to be 3" above ground. Tie these reinf. on the ground and drop them to the holes. Next call for inspection and pour the bottom 32+/- inches or leave the top 8 to 10 inches to be poured monolithic with the slab. them in place for the pour. Pouring the bottom first will not only make the forming of the top portion a lot easier but it helps make the leveling of the ground prepping for the slab much easier. When you tie the new addition to the existing house, make sure to drill and epoxy to the existing foundation. This will need the connection points be dug out much wider to allow room to make the extra work possible. The dowls to the existing house should match the horizontal reinforcements of the foundation. The dowls should be #4 with at least 6 inches embedded into the existing foundation. If the existing house was built in the era where constructing below frost line was not recognized or the existing foundation is hollow block wall, than the dowling into the existing foundation will not be necessary. If you want you can cut the vertical reinf about 30 inches longer and bent them into the slab as connection of the two pours. These will will also tie your slab and foundation together. Forming of the top portion of the pour should be very similar to the photo above. The item#2 should be 2x12 or 2x10 that runs at the perimeter marking the outside face of the addition. The anchor bolts, straps, and hold downs will be installed adjacent to this perimeter form. If you want the wall to be raised higher than the slab you will need the 2x4 or 2x6 item#1 in the photo. 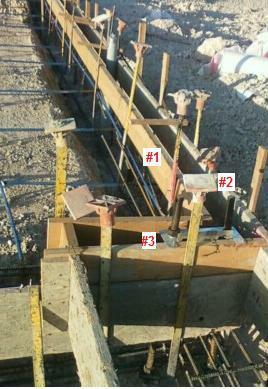 The bottom of this form will match the top of the slab before it steps up to the foundation and bottom plate of framing. Make sure these forms are braced laterally at every 5ft or so. If you want a single pour, everything mentioned above still work but during the pour start with the perimeter and pour all around to the bottom of the form, use 3 inch max slump. This will allow the concrete at the bottom part to set before you start leveling the top. I hope this answered your question. Do not hesitate to let me know if you need further clarifications.